High-quality marbles used for sculptural purposes and for decorative architecture in antiquity are usually calcitic marbles, and artefacts made of calcite marble by far outnumber the works of art made of dolomitic marble. Nevertheless, a noticeable number of sculptures in museums and private collections throughout the world have proven to be dolomite. 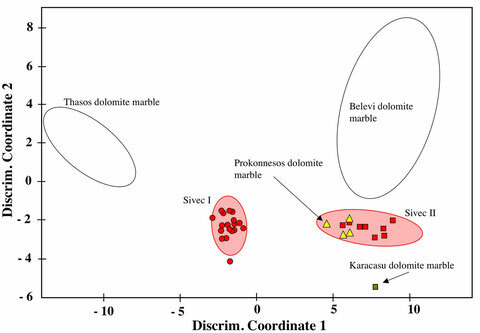 Major sources of high-quality dolomitic marbles in antiquity are rare, and the only prominent ones are the coarse-grained dolomites of the island of Thasos, Greece. 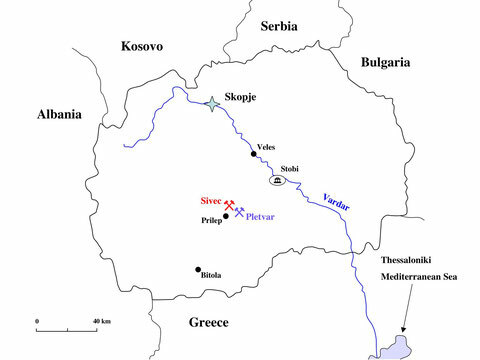 In the course of some projects in the Republik of Macedonia (e.g. Stobi) I investigated several artifacts and decorative architecure. It turned out that a very high quality, fine-grained dolomitic marble which was prominently used for elaborate pieces of work was mined in the region of the town of Prilep. Apart from the Sivec dolomites I recently found several artifacts and also ancient quarry sites and locations where fine-grained dolomites used in antiquity occur. 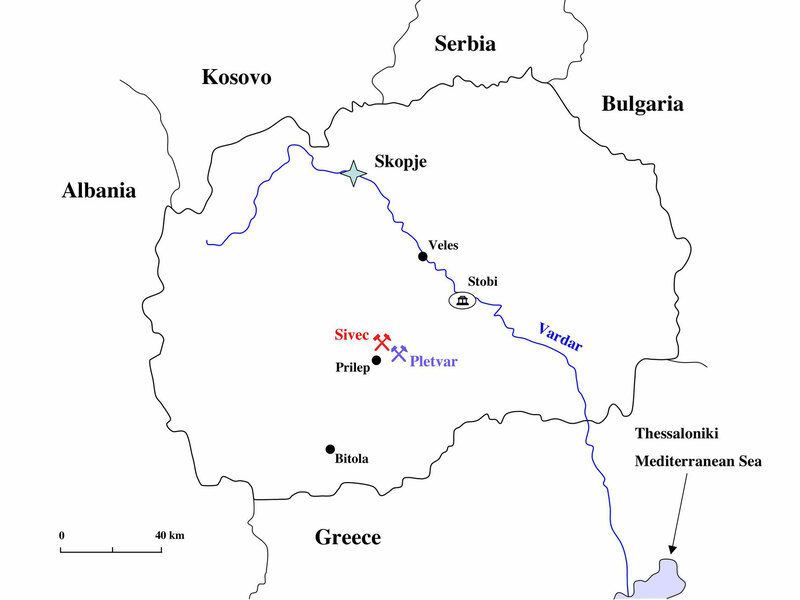 The location of the quarries of Sivec marble in Macedonia close to the town of Prilep. 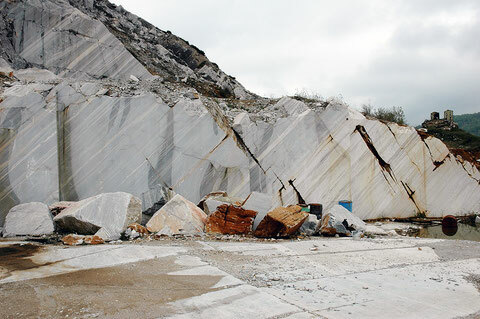 In the hangingwall of the white, fine-grained dolomitic marble next to the village of Pletvar there are other ancient quarries of coarse-grained, greyish calcitic marble which were used locally (e.g. at Stobi). Transition of the Pletvar calcitic marble in the hangingwall to the white Sivec dolomite in a modern quarry face. The dolomitic marble exhibtis macroscopically and also under the microscope all features of Carrara marble, and the two marbles can easily be confused when dolomite-selective tests are not applied. The Sivec marble is very suitable for sculpturing and inside use. 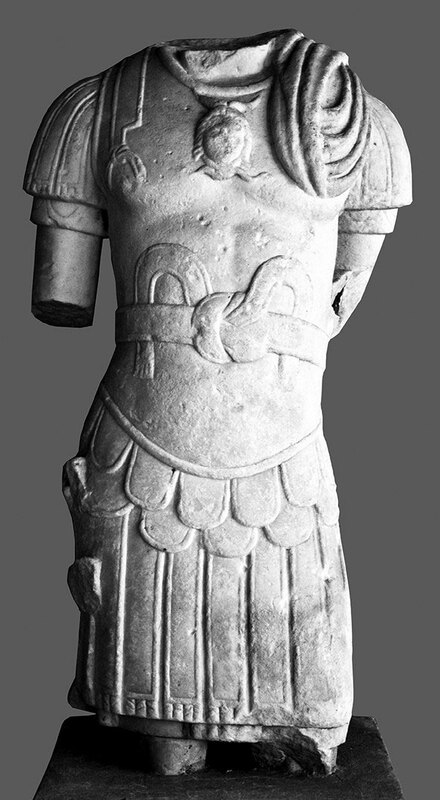 A series of high- quality sculptures of this marble was found in Macedonia and in Northern Greece. Cuirassed torso of an emperor in the National Museum in Skopje. 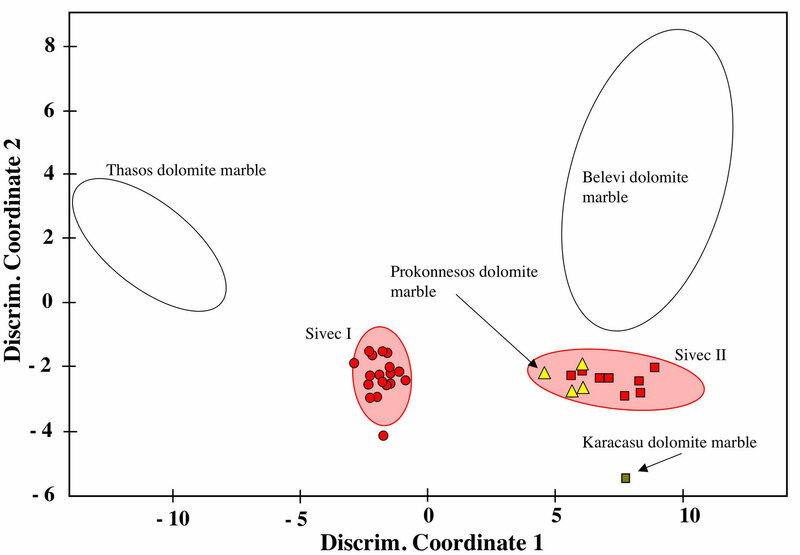 Multivariate discrimination of some dolomitic marbles used in antiquity. The multimethod investigation of the Sivec marbles revealed that two groups can be differentiated. There exists an overlap with fine-grained dolomites from Prokonnesos which are not very well investigated and the database is very small. Trace element analyses (Fe and Mn) can partly solve this problem. Niewöhner, Ph. und Prochaska, W., 2011: Konstantinopolitanisches Formenrepertoire in Mazedonien - Zur Bischofskirche von Stobi und den Marmorbrüchen von Prilep. - Istanbuler Mitteilungen 61, 433-439. Prochaska, W., 2013: A sculptural marble of prime quality used in antiquity - the dolomitic marbles of the Sivec mountains in Macedonia. - Archaeometry 22 (2), 179-197.